Discussion in 'Averitt Express' started by Iceman, Aug 15, 2010. What the latest scoop ? But remember no full names, no personal attacks or name calling, we are adults here. In order to save money, All prepass units and Fl sunpass units will be deactivated. All scale tickets for loads will be paid for by the driver, no reimbursment. The APU'S will not be used if the temp is between 20-105 outside. All trucks will be turned down to 60 mph. All T/L drivers will be required to stay out for 2 weeks. All drivers will be required to work the dock when not driving (min 2hrs off clock). You laugh. You can bet that in the back of some dank room in Cookevegas, these things you mention are being plotted about. CM, this is a GREAT descriptive photo. Of course I am the one played by Tom Cruise!!! LOL The photo speaks for itself. Thanks for posting this. This is you and me to a tee. Both excellent flyers but in each others grill always. 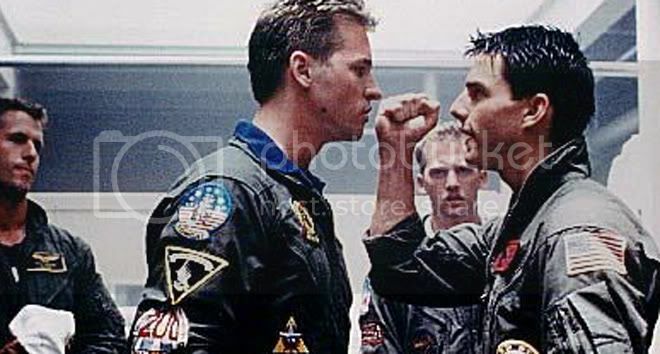 Yes you are Maverick and I'm the guy on the left,Iceman from the movie Top Gun. lifer you seem to be one of the only folks up here that live in the real world! not in a red time warp. I am a realist and see what I see. Anyone that chooses to think that Averitt is God, by all means feel that way...just realize that you are not living in an a thimble full of reality. In my many years in this business I have seen most everything from all different sides of the fence. I know I could leave if I wanted but I refuse to leave here at my age to go and start at the bottom of another equally screwed up place. I have my choice of long or short runs, I do my deal and go to the house. Playing AE's little childish games (Can you turn off your tractor so you can stand a chance of winning a pickup truck or a matchbox car?) is not my thing. If there are those that want to live a fantasy...have at it. When I hired on, corp. leaders (if you want to call them that) were exactly the same as they are today. This is utter madness. Speaks volumes to me that the shirts are clueless and therefore the policies coming down from those shirts, along with some of the management are a joke. It can be seen daily. So, I just bide my time, show yup to chuckle at the latest lunacy of the week, and breathlessly anticipate the day that I can retire and remove myself from the trucking business all together. It was fun in the early 70's but has turned to crap since then. lifer i am begining to think that you are not a team player! lol! could not have said it better myself. you the man! when i was there loke you i only cleaned my windows and nothing more. are you in fla or tx? just wondering. So you can see it also! I play the game the way it should be played, not the way some moron 1000 miles away dreamed up a new policy in his sleep. I run out of Tx. What the latest scoop ? are we tryi ng to start something here? Just speaking truth to power from a realist's POV. Avrt is going to extend the life of the daycabs by...taking all the T/L sleeper trucks currently due to be traded in , and putting them into daily linehaul shuttle service. I have always dreamed of having a sleeper truck as my nightly ride. ICE if they would have given you 12149 05 PETE to drive,b4 they gave it to some numb nut last year, you would have understood the true meaning of POWER, I think they've traded it by now, I have'nt seen her in some time, it would get over 7mpg with 40k+ lds. Would of made you a excellent ride every nite. I was blessed to have a 2000 Pete with 60k miles assigned to me when I ran into single axle weight issues. I drove it for one bid, 1093 was her number, Cat powered and super ten speed. I drove a 2010 Volvo with the ISX and auto trany a while back, after a week in her I did not want my daycab back. That dude was a horse.